I was offsite. There was just a little free time to solve the white blob mystery reported in the previous post. 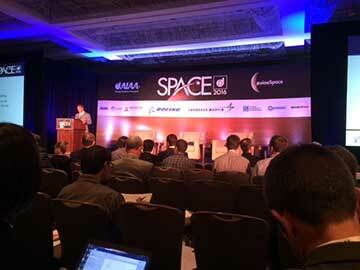 More about that latter, but first a couple of comments about the space conference. Now, the conference started early in the morning, like 8:00 AM, which I know for a lot of folks is not that early, but I had to actually set the dreaded alarm clock, the very same one I have not had or chosen to use very often, because I had no good reason for getting up early. Anyway, driving to Long Beach reminded me of when I had to get up in the morning to go to work and had to put up with traffic, but no matter what the traffic was not as bad as reported to me by Amateur Ham and Amateur Astronomer, Marty, on his Facebook page. Thank you Marty! Luckily, I didn't have to travel on the 91 Freeway this time and traffic on the 405 was actually quite good. 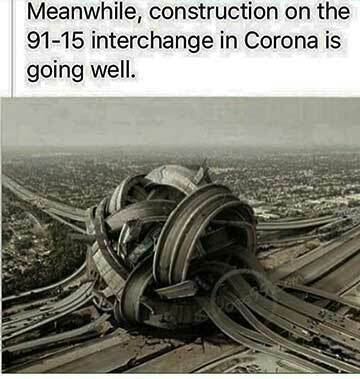 Hope your travels were a little better than on the 91. The AIAA Space 2016 conference was chock full of great presentations covering many space type applications of special interest to me including satellites and future missions devoted to putting astronauts on Mars and new orbiting observatories directed towards gathering data to gain better understanding of the mysteries and origins of astronomical objects. It was also a time to meet up with other science squad members including Math Whiz, Dave; Science Squad Gravity Guy, Ken; Wants to Build a Cubesat, Dr. Don, and new HP retiree Staying on a Boat in the Harbor, Harry. Good to see everyone and enjoyed the discussions. Thank you! There were so many interesting presentations that I find it hard to summarize the lessons learned, so let my mention just a couple of interesting tidbits that I found really interesting. Many presentations discussed the ongoing planning about how to put together a crewed mission to Mars. There is much effort in developing the spacecraft, both by NASA and privately funded companies and partnerships to make this a reality in the 2020-2030 timeframe. There has never been as many spacecraft under development as there is now. After spending many years myself doing hybrid electric drive engineering, it was interesting to see that electric propulsion for spacecraft and hybrid operation with chemical rocket propulsion is becoming the optimum solution for long range travel to Mars and beyond. The ability of squadrons of small satellites now in orbit can photograph the entire earth on almost a daily basis. The amount of information available is gigantic and what can be monitored is simply unbelievable. For instance, with daily world coverage you can measure the number of cars in parking lots as an indicator or shopping activity, monitor new construction and roads and even monitor the total amount of oil stored in the world by looking into all of the floating lid oil storage tanks. Changes made on the whole earth's surface, anywhere in the world, will be observable and be available for big data analysis. Exciting and kind of scary too! Two interesting points came out of several presentations on the Maven orbiter which is currently studying the atmosphere of Mars. Maven orbit is changed to periodically dip lower into Mars atmosphere to better characterize the structure of the atmosphere. During one of those dips, the cameras searched for the moon Phobos, which was close by at the time. The presenter said they had to search for the moon and a question from the audience why they didn't already know where Phobos would be. The answer was that yes, the position of the moon is well known, but that the location of the spacecraft was not known precisely enough because the dips through the atmosphere alter the spacecraft trajectory. So, it seems that dipping lower to explore the atmosphere leads to some unknown changes to the orbital parameters that have to be updated after the dipping maneuver. The dipping experiments help characterize the Mars atmosphere to get better understanding of why Mars lost its atmosphere and water. Another point with Maven was that when the coming Siding Springs made its close approach through the solar system and skimmed past Mars, the comet's magnetic field complexly overwhelmed the weak field on Mars and its effects were recorded by Maven. I found it quite interesting to hear that a comet, which is really just a frozen ball of ice and dust would have a magnet field at all, little alone strong enough to distort the weak field on Mars and be detectable by Maven. How does a comet have a magnetic field? Well, apparently as the comet approaches the sun and begins to vaporize the material in the tail becomes ionized by the solar wind and this moving plasma material is responsible for creating the magnetic field. How neat is that? There was one more set of interesting presentations that were, to me, part of the twilight zone or outer fringe of believability. The presentations, by the same author, dealt with Gravimetric-Electromagnetism (GEM), which is claimed to enable reactionless propulsion and how some anomalous isotope readings for neon and other elements on Mars are indications of a huge nuclear weapon massacre of a primitive civilization on Mars. Parts of the presentation were of course unbelievable but some of the technical discussion I found quite interesting and want to follow up it. For instance how is the momentum of photons changed as a light beam is bent by a high gravitational field, which it seems must happen, and is it possible to use remote sensing to determine isotope ratios of rare gases on Mars from an orbiting spacecraft. Yes, we know that gamma ray spectroscopy from orbiting spacecraft, like Mars Odyssey, can reveal the minerals and elements on the planet's surface. I would like to discuss these topics but I recognize it would take too much time to do them justice here. Maybe some future post, so stay tuned! Finally, we can return to the things amateur astronomical and report another success story in resolving the mystery of the white blobs, first reported in last week's post of September 9, in the image gathered during the search for Pluto. Remember that image was a 3-minute exposure, centered on the coordinates for Pluto's position in the sky, and while Pluto was not visible, due to being washed out by high ambient city lights, the mysterious white blobs showed up. Last time, we opined that they did not seem to be dust donuts, with the hole filled in, nor did they seem to be bright fires caused by the Plutonians burning stacks of Mike Brown's book, "How I killed Pluto and why It had it coming". So what are the mysterious blobs? Well to get an answer to that I reached out to my goto expert, Author and OCA Secretary, Bob, who said they are probably images of dim stars, whose appearance has been smeared out due to atmospheric effects and scope mount wander and jitter errors. Bob, has written two great books for amateurs, both of which I have, "The Sky is your Laboratory" and "Astronomical Discoveries you can make too!". Hey, that immediately sounded like the right answer to explain the blobs. Now, why didn't I think of that? Because I'm just an amateur and these are the lessons learned as we continue along this journey. Now, as a physicist wannabe, I wanted to get some evidence to corroborate this idea and elected to re-analyze the original image, this time however, overlaying the image with the star pattern from the catalog with more of the dimmer stars, up to magnitude 13. This generated an overlay file with over a thousand stars in it as compared to the original file which only had about a hundred stars. With this overlay, the exact position of the stars in the image can be located, in terms of their right ascension and declination, and the blobs can then be seen to be associated with actual dim stars. See the image below showing the AIP4WIN analysis. The location of Pluto is shown at the middle of the three linearly arranged red circles. These red circles are my hack to insert the location of Pluto into the image. The middle circle of the three red circles should be the actual position of Pluto. I kludged the three circles so that they are exactly 1 arc minute apart. The location of Pluto is also identified as my first target location, T1, shown in yellow. Other yellow tags were placed on top of some of the blobs so that I could check their actual locations with known positions of background stars. As we discussed last time, Pluto is too dim to show up in this image because it is dimmer than the background city light pollution. 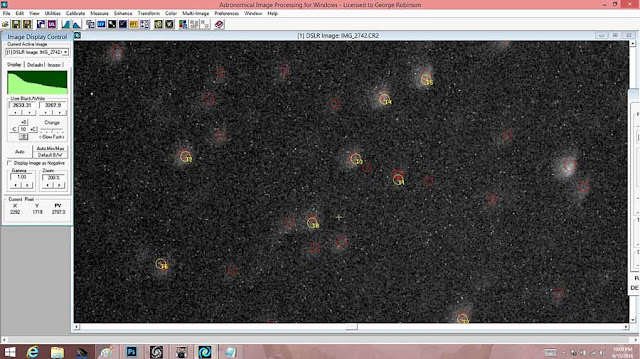 Note how many of the blobs now have red circle overlay on them. This means that the location is the same as a dim star from the star catalog. 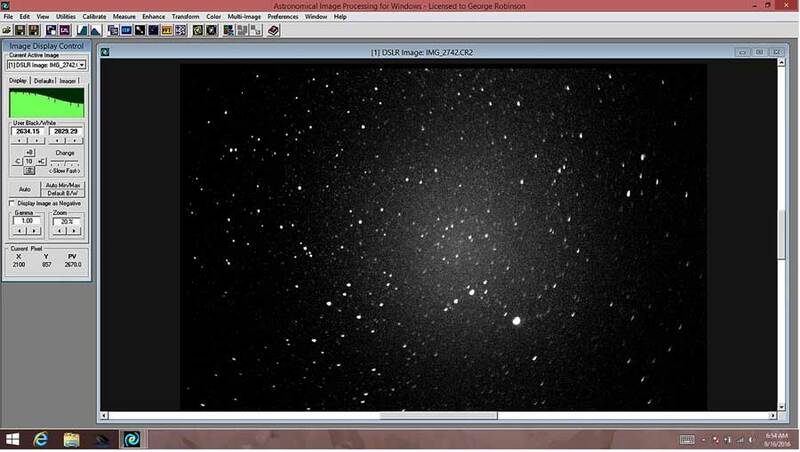 So, it seems conclusive to me that the mysterious white blobs are just smeared out images of dim stars. Great lesson learned. Thank you Bob! 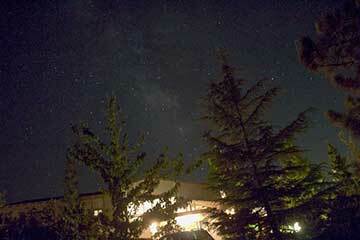 This final screenshot shows the entire image of this 3-minute exposure and what other effects do you see here? Well, you can see the vignetting effects, which result in objects near the center of the lens to appear brighter than objects near the edge of the 600mm lens. More serious amateurs will correct for this distortion by collecting a series of flat exposures so the effects of vignetting can be compensated for and then any future images can be processed to include this correction. If you want to compare the magnitude of a star in the center of the field of view with one on the edge you will need to do this correction. I'll get around to doing that later. For now I'll just take the easy way out. Finally, while I was having fun in Long Beach, a new toy was delivered to the observatory front door. 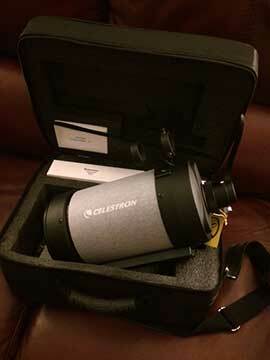 The photo shows the new Celestron C5 Spotting Scope in its travel case. This scope only ways 6 lbs. and hopefully fits in well with my desire for quick and dirty set up without gong to the effort of setting up the big scope. The spotting scope has the same objective size as the big scope and actually longer focal length of 1250mm. This new tool (toy) with longer focal length hopefully will extend the range of images from the 600mm lens and allow for larger views of objects, like planets. It only weighs 6 lbs compared to 4.3 lbs for my 600mm telephoto lens and weighs much less than the 20-30 lbs for a telescope with the same size. This light weight will allow me to quickly setup and take longer focal length images of objects without me spending a lot to time and energy of lugging the heavier scope and mount out and about. It's all about convenience and ease right now. What quality of images are possible? We will have to wait and see what happens. Stay tuned!